I loved this. I sat through it with a big stupid grin on my face the whole time. I liked the story, the humor, the music (not quite as great as the original, but solidly fun), the corny-sweet ending. Erin had a few quibbles about the size of the town/kingdom, and he wasn't as immediately charmed by this as I was. My main structural quibble is that a 21-minute special with four new songs doesn't really have time for two of those songs to have effective reprises. To me, those reprises felt like lazy ways to hit emotional beats. My only other experience quibble was that it took me a few minutes to readjust to Kristen Bell's voice being Anna of Arendelle rather than Eleanor Shellstrop. Olaf's Frozen Adventure is currently playing in theaters before the new Pixar film, Coco. I noted that it takes place at Christmas, and Coco takes place on Dia de Los Muertos, so the film release date splits the difference by landing on Thanksgiving. 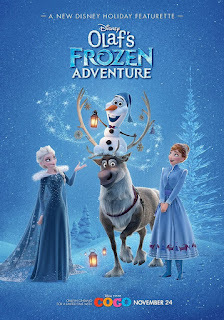 It is quite long for a pre-movie "short," though, and I'm sure it will be released alone or alongside the other Frozen special at some point.